The Alpha Series is an arsenal of relentlessly-inventive loading docks, forklift ramps, and platforms. These premium products offer patented features that tackle employee safety, operational issues, and worksite hazards. 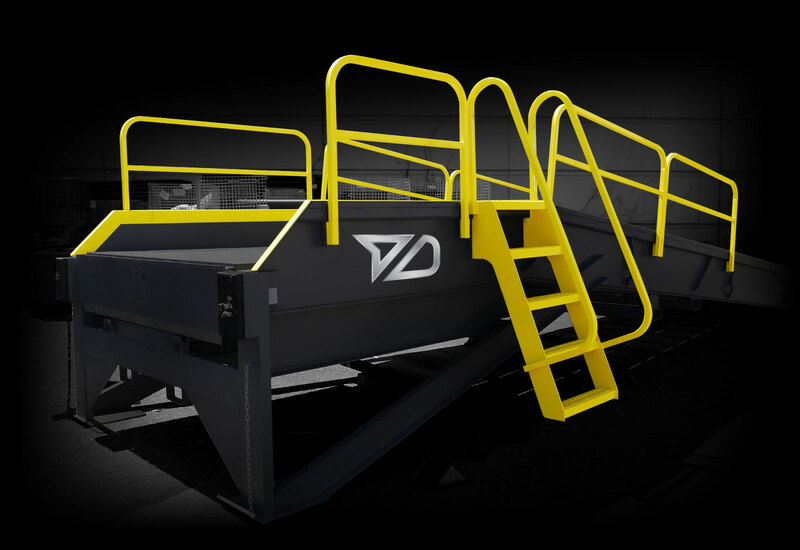 This series showcases the Portable Loading Dock – the cornerstone of the Dockzilla brand and, for many businesses, the ultimate Alpha game-changer. The Portable Loading Dock is the cornerstone of the Dockzilla lineup. This heavy-steel loading dock features a patented trailer impact-resistant design to deliver the integrity of concrete in a flexible forklift loading ramp. Showcasing massive front safety legs, this self-standing yard ramp mimics the performance of a permanent dock when added to any worksite, leased facility, or parking lot. For high-volume loading operations where flexibility is key, the Mobile Loading Dock easily moves and engages to load trailers anywhere. This “mobile yard ramp on steroids” intuitively eliminates a) intense manual pumping, b) “single-fork” forklift engagement (there’s a reason there are two), and c) the threat of a flat tire while hauling massive loads. The Dockzilla Extra Wide Loading Dock provides a 9 ft. of clear width loading deck that sets up outside the trailer doors to accommodate oversized loads and trucks that arrive off-center. Engineered a full 12” wider than traditional mobile yard ramps, this expansive loading ramp tackles space limitations and side curb interference that keep forklifts from filling trailers. When loading requirements are intimidating as a 30-ton bulldozer, our high-capacity implement loading docks are longer, wider, and stronger to manhandle any project. Engineered to accommodate massive agricultural, military, and construction equipment from 35,000 lbs. to 85,000 lbs., these docks are built standard in widths up to 168″, with unique materials like replaceable wood decking, and exclusive “never-flat” solid wheels.